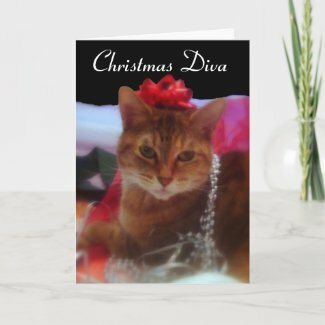 Today's card features a true Christmas Diva, our cat Isabelle. 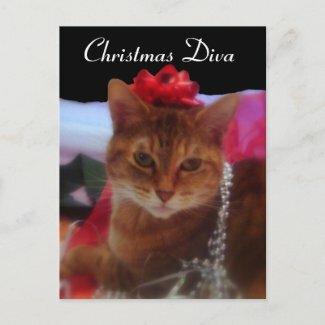 She's a diva the rest of the year as well. We have other cats but her majesty doesn't seem to be aware of this. In her mind everything is about her and she is very offended when we pretend otherwise. 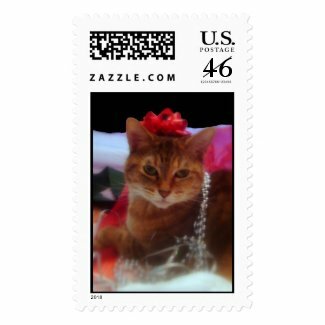 This photograph of her was taken at Christmas a few years ago while we were opening our presents. We used to buy presents for our feline kids but we quickly realized that the ribbons, bows, paper and boxes were presents enough for them. 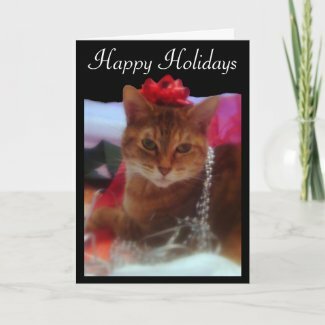 Still, the other cats would not appreciate it if we tried to drape them with garland or put bows on their head but Isabelle loves it. That day I remember she acted as if we were adorning her with jewels and a crown and she was very proud to have her picture taken with them. Eventually she discarded these treasures so she could combat some wrapping paper and then she arranged herself inside a gift box and fell asleep. Isabelle turned 15 this year but she is still very active commanding our attention like the diva and the very precious gift that she is. I can't wait to see what she will do this Christmas.